When Alabama Joe drifted into Fort Anxious, his one friend there was the boy Jimmy Green. Most people thought Joe was just an easygoing tramp who would do anything to avoid a fight. Stanley Parker, however, suspected that the stranger was more dangerous than he pretended to be. 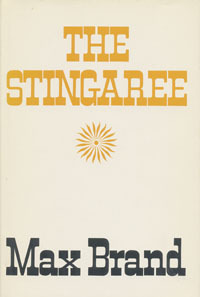 Ever since Parker had won fame and fortune by gunning down the notorious Bob Dillman, he had been expecting the outlaw's partner, the deadly Stingaree. And Parker knew he would have to kill the Stingaree - if he could! Here is a fast-moving story of a man of many names aned many skills who found that his ordeal had just begun when he met his enemy. Ahead of him lay the perils of hired guns and wilderness traps and a bitter conflict with his own code of honor.